Last weekend I attended London’s annual Language Show for the fifth year. The event runs for an autumn Friday, Saturday, Sunday and is a mix of trade fair, training event and chance to meet other language learning enthusiasts. It’s free (though you register for a ticket online in advance). Many of the attendees are language professionals (translators, interpreters), educators (school teachers and teachers of English to adults). Other target groups are commercial language course providers and recent language graduates or others with language skills looking to use them in a new career. It was encouraging that this year there seemed to be a bit more emphasis on adult independent language learning learners (that’s us, dear reader). There was a talk track specifically for “People who love languages”. 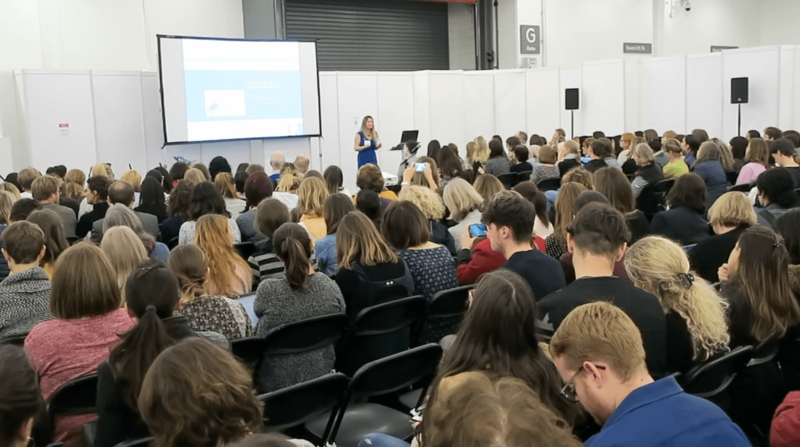 It’s impressionistic, but two of the people I spoke to in the vlog said they felt the balance of offer and attendees had shifted a bit this year and that there was less on the translation side and more aimed at teachers. (There’s a breakdown for 2016 on the Show’s site showing that 29% of visitors described themselves as “language learners”, 13% as “linguists”, 18% as interpreters/translators and 40% as “teachers”). As in the previous three years, I turned up with my vlogging camera and I’ve done a vlog, the link is at the bottom of this post. Vlogging is a great way for me to show you the event and to fix my own memories. On the day, it’s also an excuse to approach all sorts of different people for a quick chat. Last year, the Show left west London’s Olympia complex for the spectacular Victorian main hall of the Business Design Centre in Islington, north London. Pre-show publicity had been scanty. While entrance was still free, there was a charge for the talks and fewer stalls on the main floor. Several told me then that the organisers were running down their involvement with the event and it was moving back into the hands of the orignal founder, Jonathan Scott. This year we were back at Olympia, albeit in the smaller (though still very far from cramped) West Hall. There were fewer stands than I remember from my 2014, 15 and 16 visits. The event was also about a month later than usual. This all suggests that the new (old) owner is steadying the ship, ready (I hope) to expand again. The vibe was as good as usual! In the years I’ve been attending, there’s always been an open stage space called the “Piazza” for talks and performances and several other talk locations in the main hall itself. In previous years, though, the bigger talks have been held in side rooms away from the main floor. This time everything went open-plan. Chairs were set out in dedicated areas round the side of the West Hall. You had to wear headphones for the amplification (and to cancel the noise from the rest of the show). One speaker told me she quite liked the arrangement as it meant that passing visitors were more likely to join a talk. The talks, as you’d expect with this lay-out, are free once again. This year I heard my friend Michele “the Intrepid Guide” Frolla talk on “How to uproot your life and move to the other side of the world”. On Friday, Polyglot Conference founder Alex Rawlings had spoken on “Languages for a world without Grenzen” (his talk from the Conference a few weeks ago). Fearless Frolla (Michele, the “Intrepid Guide”) goes all Italian on the Piazza. Wending my way through the stands, I caught up with Emma from TeachYourself who said that the new short story books by Olly Richards and Judith Meyer’s “Script Hacking” books (both featured in my vlogs from the Polyglot Conference), and Benny Lewis’ Language Hacking books were selling well. I wonder whether some of the other bigger publishers I remember being here a few years ago (such as Routledge and Collins) will soon be back. Small, one-off publishers seem to come and go from year to year. Perhaps the economics don’t always work for them, and maybe some sort of large, shared stand for small and private publishers would make sense. On the audio/visual and electronic side, it was great to catch up with show regulars uTalk, who have added Manx to their roster of 140 languages. Where though were the likes of Flashsticks or HelloTalk? As usual a number of “official” language institutes had stands: the British Council, the King Sejong Institute (Korean) were there, as were the Cervantes Institute (Spanish), Goethe-Institut and the Institut Français (the jobsworths on the latter two were scared to speak on camera without approval from above in previous years, so I didn’t even bother asking this time round). The Confucius Institute usually have a large stand for Mandarin but were absent this year. I also missed Welsh for Adults who appeared a couple of years ago and had – it seemed to me – created a bit of a buzz round their stall. The Basques were there my first year but I haven’t seen them since. There was a Welsh taster session in one of the event spaces on the main floor on the programme, so the Red Dragon flew. I caught parts of the Greek and the Japanese tasters, both of which were well attended. Given the Brexit vote this must surely be the last year that the EU has a large stand at the Show? As usual there were reps from their legal translation services and the interpreters from the parliament. It was great to get into the booth they had set up and have a go at simultaneous interpretation. I chose to give it a go from German into English (from a video recording of a short speech – it’s the norm to translate into your mother tongue). The main challenge wasn’t understanding the content, it was producing serviceable English in time (and fighting off the influence of German word order or prepositions when they differ). It was great to see some traditional Iranian dancing on the Piazza towards the end of my day. The music from the performance area often permeates the hall and adds to the atmosphere, even if you aren’t right there watching. I had only one gripe – the coffee! 😉 A long queue and then no espresso at the end of it doesn’t make for one happy vlogger. I was tempted to take half an hour out to go and find a coffee shop elsewhere but there was too little time and too much to see. Afterwards, Michele, Kerstin from Fluent Language, and Lindsey from Lindsey Does Languages has organised a meetup at a nearby gastropub. A lovely sociable way to end another year’s trip to the Language Show. Maybe I’ll bump into YOU there next year….